Although your ferment will get started more quickly if you add a little brine or whey from a previous ferment, it is not necessary. If you are fermenting from scratch, use this ratio as a guideline: three tablespoons of sea salt per five pounds of vegetables. If you do have some brine or whey to start your new ferment, you can cut the salt in half. For the sour pickles in the video below, I started from scratch. Another shot of the picking cucumbers on day one. If cucumbers are unwaxed, slice to desired thickness. If cucumbers are waxed, peel and slice to desired thickness. The larger the slices, the longer the time needed to ferment. Combine salt and cucumbers in a large mixing bowl. Let sit for 20 minutes. Cucumbers will begin to sweat. 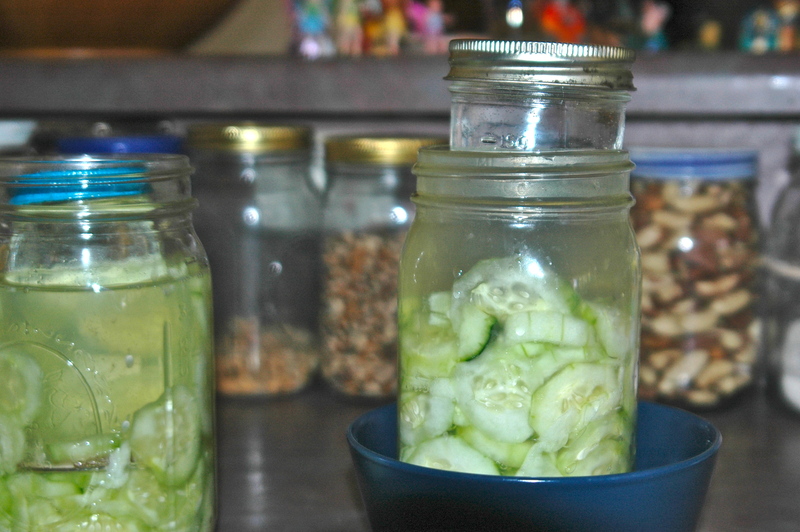 Pack the cucumbers into the two quart-size mason jars. As you spoon the cucumbers into the jar, press them down to remove any trapped air. If the cucumbers have not given off enough liquid to completely cover themselves once packed in the jars, add just enough water to cover them. If more than a half-cup of water is added, you’ll need to add more salt to maintain the salinity of the brine. 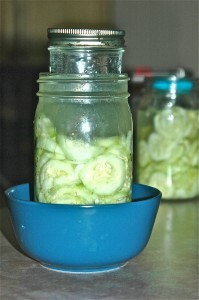 Once the cucumbers are packed, place a small canning lid inside each jar, on top of the cucumbers. Fill the pint-size jars with water and seal them. 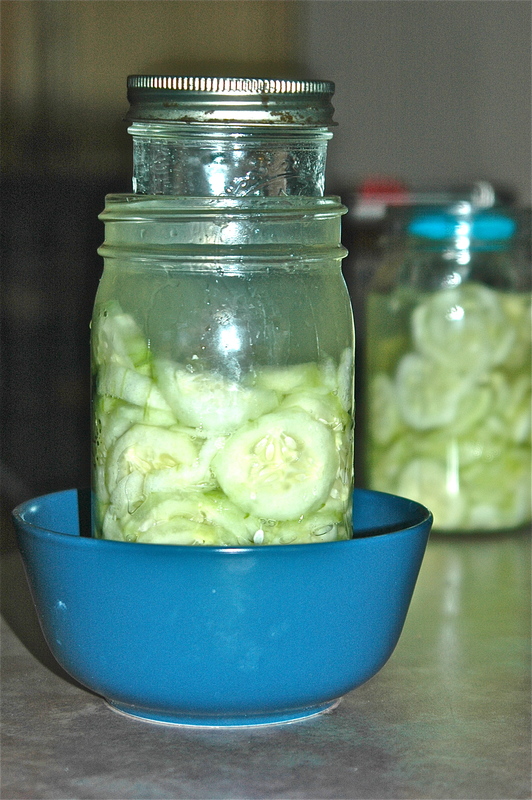 Use these as weights to push the bubbles out of the fermenting cucumbers (Insert the smaller jars of water in the open jars of cucumbers, on top of the regular canning lid. 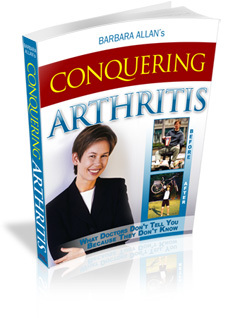 Push down on the weights once or twice a day and watch the trapped bubbles rise to the surface). Depending on the time of year and the climate, the cucumbers will take between one and two weeks to ferment (The colder the climate, the longer the fermentation will take to finish). 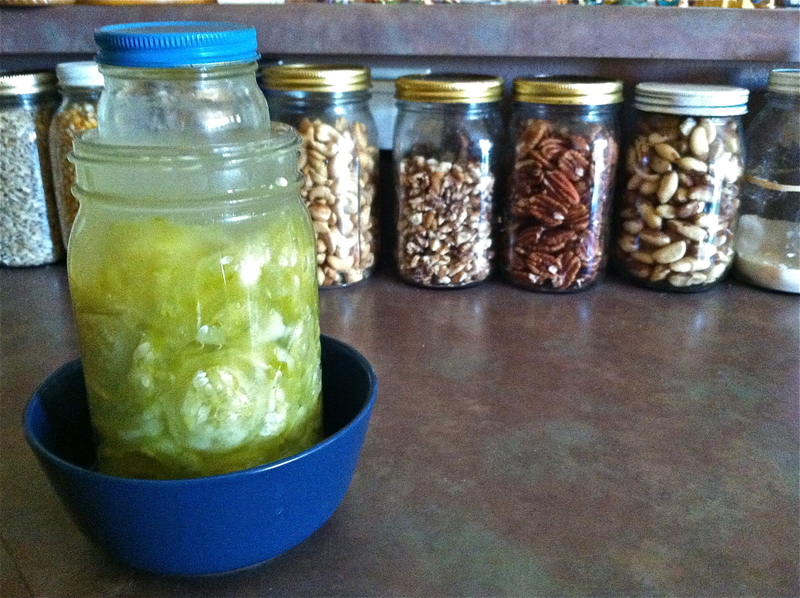 You may wish to combine the two jars after the cucumbers have fermented enough to take up only half a jar of space. When bubbles are no longer forming, the fermentation process is complete.